From the world heritage listed Great Barrier Reef and pristine beaches of north Queensland to the rugged rocky outcrops and red sand of north-west Queensland and into the Northern Territory, the Overlander's Way will take you through architecturally rich historic towns, dinosaur centres and to the home of some of the world's most quirky events; without even leaving the bitumen! Follow in the footsteps of Australia's droving heroes, who drove mobs of thousands of cattle from the Northern Territory across Queensland's vast interior to the coastal markets and discover the unspoilt beauty of Outback Queensland. Although this stretch is short in distance, it’s rich in things to see and do, so take at least a day to explore the vibrant coastal hub of Townsville. Take a trip out to the Great Barrier Reef where you can dive or snorkel with colourful fish, giant turtles and a forest of bright coral. Visit Reef HQ Aquarium where you can experience the world’s largest coral reef aquarium and visit the Turtle Hospital. Learn about the HMS Pandora, which sank on the Great Barrier Reef, at the Museum of Tropical Queensland, see local wildlife at Billabong Sanctuary or try fresh regional produce at the North Shore Farmers Market. The Strand runs along the beach and offers many dining, café and bar options. Magnetic Island, just a short boat ride away, is home to a colony of koalas and comes alive with young, energetic locals and visitors from around the world for a monthly full moon party. As you head west towards Charters Towers, call in at Ravenswood to see magnificent restored buildings and mining remnants such as mullock heaps, old shafts and chimneys stacks. 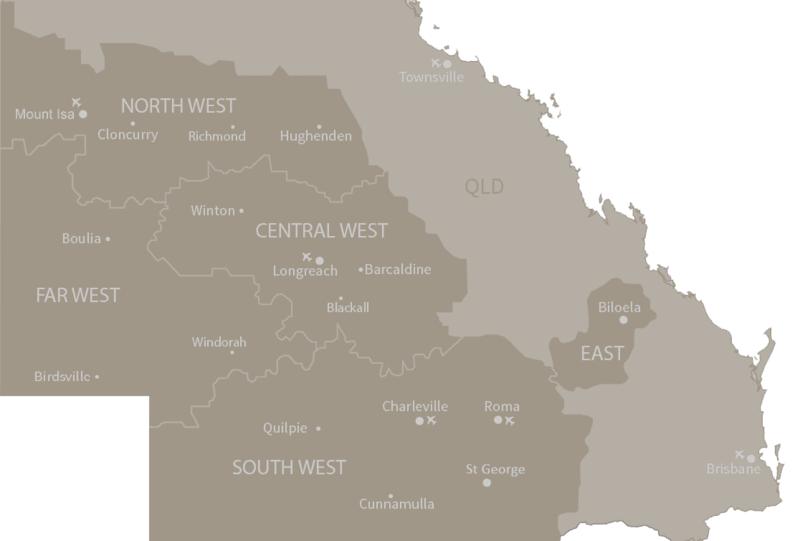 Then continue on to Charters Towers, a beautifully preserved part of North Queensland history. This gold mining town was once the largest city in Queensland after Brisbane. During the gold rush, the town boasted 65 hotels and 29 crushing mills. The prosperity of this era can be seen in the beautifully preserved city centre, known as ‘One Square Mile’. The stories and legends of the gold rush have been brought to life on the Ghosts of Gold Heritage Trail: The discovery of Gold at the foot of Towers Hill; the Grandeur of the historic One Square Mile; Greed at the Stock Exchange Arcade; and the Ghosts of the Venus Battery. Queensland’s last bushranger was laid to rest at the Charters Towers Cemetery, where you’ll find the graves of other notable people including Jupiter Mossman, the Aboriginal boy who helped discover gold at Charters Towers. From the glory days of the late 1800s gold rush, head to Hughenden to step back even further in time to the era of dinosaurs. 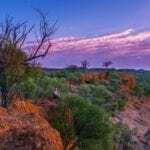 Along the way, stop at Burra Range or Mount Walker lookouts for an uninterrupted view of the densely wooded buffel country. In Pentland, visit the Norwood Police Cells for a glimpse into the tiny town’s past and take a break at the welcoming Pentland Hotel. Hughenden is the heart of dinosaur country; in prehistoric times, it sat on the shoreline of a great inland sea. Nearly 3000 dinosaur and marine fossils have been found in the surrounding countryside. To get a true idea of the beasts that roamed these lands, check out the life-size replica Muttaburrasaurus. This rare find, the first entire dinosaur skeleton found in Australia, catapulted the area into international fame. ‘Hughie’, as the skeleton was nicknamed, is on display at the Flinders Discovery Centre. Porcupine Gorge, known locally as ‘Australia’s little Grand Canyon’ is 63 kilometres north of town and Blackbraes National Park, with its unique basalt features is around another 90 kilometres north. Venture ‘underwater’ into the prehistoric inland sea to Richmond, the fossil capital of Australia. In Richmond, explore the amazing collection of marine reptile fossils at the award-winning Kronosaurus Korner. The museum is home to Australia’s best-preserved dinosaur skeleton, Minmi, and the Richmond Pliosaur, one of the world’s best skeleton fossils. See the fossil preparation area, then grab a map and fossick at one of the free designated sites and have the fossil centre curator identify your find. Explore the Bush Tucker Gardens on the banks of Lake Fred Tritton where you will find local native plants labelled with their traditional purposes. The lake has sandy beaches, a boat ramp, free barbecues and a playground, making it an ideal place to relax, swim and fish for barramundi or red claw. Richmond’s business district of yesteryear can be discovered on the Heritage Walk, which includes a replica of an original 1860s homestead. Stop in at the quaint little town, Nelia approximately 50 kilometres east of Julia Creek. 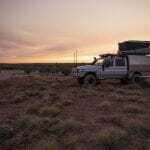 Here you will find the world’s largest brolga sculptures and Corella Creek Country Farm Stay which offers a variety of accommodation options and outback experiences. 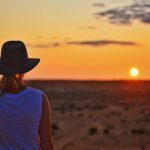 Head further west to Julia Creek for spectacular outback sunsets and a chance to gaze at a thick blanket of stars that covers an outback night. The Julia Creek Dunnart is a tiny endangered marsupial who lives in a special nocturnal viewing area at the Visitor Information and Interpretive Centre, called ‘At The Creek’. This centre is built from recycled materials sourced from local railway fettler’s cottages and focuses on the themes of water, Country and people. Learn how the Great Artesian Basin sustains life in the outback, have a picnic on the moon rock chairs and tables, or go underground to explore the geological features that shaped the region. Follow the nature trail or take a historical walk through the township. The remains of a WW2 Directional Finding Installation can be seen near the airport. Come April, the town population swells to 3000 for the annual Dirt ‘n’ Dust Festival. The program includes a triathlon, horse races, bull ride and typically outback novelty events such as mud snorkelling races. Continue along the Overlander’s Way to Cloncurry, the birthplace of the Royal Flying Doctor Service, which is as integral to outback survival today as it was when it serviced these remote outposts of Australia’s vast inland when the Reverend John Flynn launched the flying medical service in the 1920s. Learn how he harnessed the emerging technology of the pedal radio to pioneer outback radio communication when visiting the John Flynn Place Museum and Art Gallery. On the theme of aviation, visit the original Qantas hangar where the first passenger flew from Longreach to Cloncurry in 1922. Cloncurry was named by explorer Robert O’Hara Burke and you can see his drink bottle at the Burke and Wills display in the Cloncurry Unearthed Museum at the Mary Kathleen Memorial Park, where you can learn about the former Mary Kathleen uranium mine. 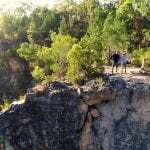 Other attractions include the Cloncurry Cemetery with graves dating back to the 1880s, the Court House, which was built in 1898, and Chinaman Creek Dam where you can swim, picnic and take in an outback sunset. From Cloncurry, the Overlander’s Way winds through the spectacular Selwyn Ranges to Mount Isa. Mount Isa is Outback Queensland’s only city and offers a melting pot mix of culture, industry, history and nature. The town’s major industries are mining and beef production, and visitors can experience both at the Outback at Isa visitor centre, home to the replica Hard Times Mine. Descend 22 metres underground to feel the earth move with the firing of the drill face and use real mining equipment. Outback at Isa also houses an outback park and the Riversleigh Fossil Centre. Join the resident palaeontologist on a lab tour to see exciting local fossil finds. Lake Moondarra, a few kilometres out of town, offers excellent barbecue facilities, swimming, fishing and a lookout. Before leaving Isa, call in to the School of the Air for a glimpse into classes conducted via satellite internet with students from remote communities and cattle stations. See the WW2 Underground Hospital, visit the National Trust Tent House, take a surface mine tour and see inside the Bureau of Meteorology. The final stop is Camooweal. There you can visit the Drovers’ Camp to learn about this historic droving town or the Camooweal Caves National Park, which is honeycombed with sink holes dating back 500 million years.